The last of this year’s Oscar nominated Animated films to be released in the UK is also perhaps the sweetest, a beautifully realised piece of stop motion animation about children growing up in a care home. It’s been a very good selection this year and ‘My Life as a Courgette’ is deservedly amongst such strong company. Clocking in at just over an hour, this is one of the shortest films I’ve ever seen, but that brevity doesn’t count against it and it manages to achieve greater depth in its short runtime than many films twice as long. The story mainly focuses on a young boy (who likes to be known as ‘Courgette’) who is sent to a care home after losing both his parents, and it follows his interactions with both the adults and the other children who find themselves in a similar situation. A tragic opening establishes how Courgette finds himself in a care home, with an almost wordless sequence effortlessly depicting Courgette’s difficult home life and why he is the kind of person he is. 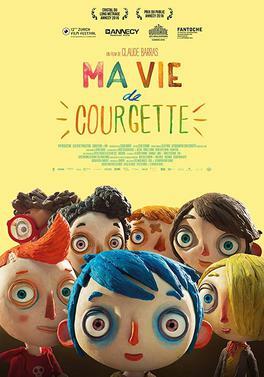 This isn’t a warm and cuddly animated film and it covers some very dark themes (with a lot of skill) as we follow the lives of Courgette and the children he meets in the home. The film is written by Celine Sciamma, who directed the excellent French coming of age film ‘Girlhood’, and her talents are fully on show once again. All of the characters are written with great depth and compassion, from a bully to a girl who will barely speak, and the film avoids painting them as easy archetypes (with one notable exception). This is a film that wants to show the darker side of childhood and in particular, emphasise that many children do not grow up in warm, loving environments. That it manages to achieve this whilst also offering some kind of solace and hope is a minor miracle and is testament to the strong writing and loving craft that has gone into the filmmaking process. That’s not to say ‘My Life as a Courgette’ is an entirely difficult watch, as it’s often very funny, uplifting and a testament to the resilience of the human spirit against often challenging odds. I thought the film was a sensitively made and deeply affecting piece of filmmaking, and I would highly recommend taking an hour out of your day to check it out.